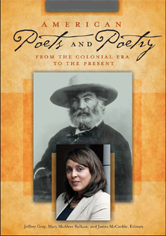 Written for high school and undergraduate students, this encyclopedia covers U.S. poetry from the Colonial era to the present, offering full treatments of hundreds of key poets of the American canon. What sets this reference apart is that it also discusses events, movements, schools, and poetic approaches, placing poets in their social, historical, political, cultural, and critical contexts and showing how their works mirror the eras in which they were written. Readers will learn about surrealism, ekphrastic poetry, pastoral elegy, the Black Mountain poets, and "language" poetry.